Just east of Madagascar in the Indian Ocean lies the tiny island republic of Mauritius, birthplace of University of Texas astronomer Shardha Jogee. With a blossoming career that just doesn't seem to know any bounds, Shardha has followed an exciting path since completing her high school education. She was a Physics scholar and fellow at the University of Cambridge in England, a graduate scholar in astronomy at Yale University, and received numerous awards including an Amelia Earhart Fellowship and a prestigious long-term space astrophysics (LTSA) grant from NASA. She is generally considered one of the foremost experts in the evolution and structure of disk galaxies, and her research is frequently covered by the popular press, including ABC, MSNBC, Sky & Telescope magazine, Science magazine, and Reuters. Mauritius to England to the U.S.
Mauritius has a unique history. It was discovered by the Portuguese, named by the Dutch settlers after the Prince Maurice of Nassau, colonized by the French and British, and finally gained its independence in 1968! Its local population derives primarily from immigrants who came from Europe, India, China, and Africa in the late 1700s. Shardha's own ancestors are believed to have come from India, perhaps 150 years ago. Today, Mauritius is an elite tourist destination for Europe: the entire island is basked in a cerulean blue ocean, embraced by coral reefs, wonderful landscapes, chic hotels, cosmopolitan hosts, and sophisticated cuisine. No wonder Mark Twain (1863-1910) said "You gather the idea that Mauritius was made first and then heaven, and that heaven was copied after Mauritius"! While Shardha's native spoken language is French, she also speaks three others, including English. Once Shardha finished primary schooling in Mauritius, she left in 1989 for Cambridge University, England, where she was an undergraduate scholar and Fellow in Physics. She earned bachelor's and master's degrees in physics by 1992 from Cambridge. Thereafter, she arrived in America to pursue graduate school at Yale University. There, she earned her M. Phil. (1994) M. S. (1994) and Ph.D (1999) and received the Yale University J. F. Enders Research Grant and Fellowships, a Sigma Xi Grants-in-Aid of Research, and the Amelia Earhart Fellowship. After Yale, Shardha took up a position as a postdoctoral research fellow at Caltech from 1999 to 2002. During that time, she expanded her research activities to address observational and theoretical aspects of the evolution, structure, and activities of disk galaxies over a wide range of cosmic lookback times. Following a national competitive process, NASA awarded her in 2003 a long-term space astrophysics (LTSA) grant of $558,000 in order to support her research. In 2002, she was offered a tenure-track astronomer position at the Space Telescope Science Institute (STScI) in Baltimore, Maryland, the institute directing the scientific mission of NASA's Hubble Space Telescope. At STScI, she gained recognition as an expert on disk galaxies and bars, and soon joined the international GEMS, GOODS, and HUDF teams to conduct some of the most powerful galaxy surveys to date. 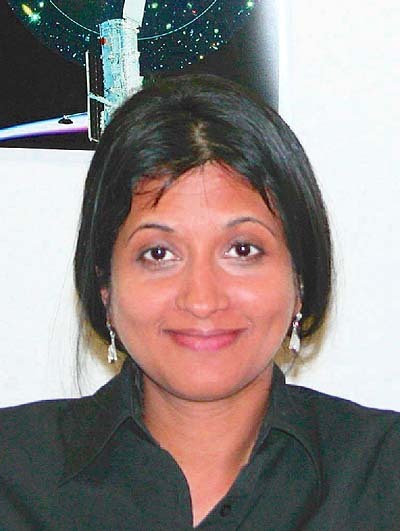 Shardha stayed at STScI until 2004, when she obtained a professorship at The University of Texas at Austin. Today, she leads an active research group there consisting of five undergraduate and graduate students and two postdoctoral fellows. She is also currently the Department of Astronomy's undergraduate advisor and is working with science educators with the goal of attracting excellent college-bound students into the sciences at UT-Austin, and in particular, into astronomy. In her free time, Shardha enjoys dance, theater, music, yoga, and travel. She has indulged in rock, jazz ballet, swing, and now wishes to master the Latin flavors. She attends several astronomy conferences each year, giving her opportunities to travel all around the world.